Forecasting January 'til June! An inferencing activity! So this idea was discussed during dinner at my house the other night, LOL. You often see teachers/SLPs handing out "goals for the year" worksheets in September, and then they hand them back out in June. What happens in between though!? 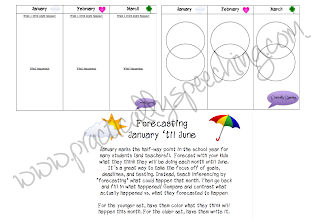 Now that a new year is upon us, use this time to "forecast" until June! Have students use this monthly activity to inference what they think might happen that month. Then, at the end of the month, go back and have them fill in what really happened! Use the compare/contrast venn diagram to help them discuss what was different and what was similar. Also, setting smaller goals can be helpful for students. Use these sheets as a way to set monthly goals with your students. At the end of the month they can go back and see if they've accomplished their goals!